Herb Feemster is better known as Herb Fame, half of the Grammy Award® winning singing duo, Peaches & Herb. The duo’s iconic love song, “Reunited,” reached the number one spot in April 1979 and remains one of radio’s Top 25 Most Played Love Songs of the past three decades. 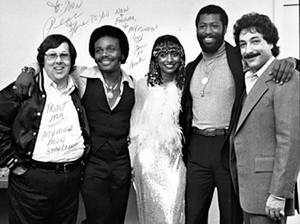 (L-R) Dan Acree, Herb Feemster, Linda Green, Teddy Pendergrass, and Paul Cohn. In preparing to write this column, I was doing research on some of my former clients—people I represented when I was a Hollywood publicist between 1979 and 1986—and I came across a website for Peaches & Herb. I sent an email to Herb’s son and business partner Chris, asking him to forward my email to his father. When I met Herb in Fall of 1979, he and Peaches (Linda Greene) were on a major high from the success of two consecutive #1 hit records. The disco classic “Shake Your Groove Thing” had been released in December, 1978, followed four months later by an even bigger hit, the makeup anthem, “Reunited”. 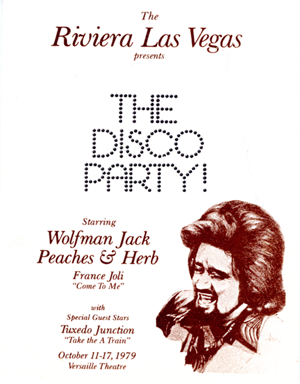 I had been with my boss, Wolfman Jack, at The Riviera Hotel & Casino in Las Vegas, where he was producing and hosting “Wolfman Jack’s Disco Party,” a one-week stint of two shows a night. Peaches & Herb were the headliners. Also on the show was sixteen-year-old French Canadian ingénue, France Joli whose dance sensation, “Come to Me,” was soaring up the charts. “How you doin’, trust-me man?” said Herb. This was a running joke during the few years that I represented Peaches & Herb as their publicist. “Trust me,” was my favorite line in those days. It was almost always an indication that I was in over my head and grasping for an answer. That distinctive voice of his brought it all back. If you read the first installment of my back story in the Winter ‘08 issue of this magazine, then you know I was working for Wolfman in 1979, as head of marketing and promotion for his Hollywood, California, entertainment company. Publicizing “Wolfman Jack’s Disco Party” was my responsibility. Here’s a guy who had already been a star in the 1960s with the first Peaches (Herb has always been the “Herb,” but “Peaches” has been portrayed by five different women, including Linda Greene from 1976-1988). With the first Peaches, (Francine Barker), Herb recorded a string of now-classic songs, including “Close Your Eyes” (a #8 hit on the Billboard Hot 100 chart in 1967, and also their debut single), “Let’s Fall in Love,” “For Your Love,” and “Love Is Strange” a remake of a ‘50s classic hit. Now, here he is making a comeback in the late ‘70s with two number-one songs to his credit in less than a year. I was impressed by Herb’s cool, friendly personality. We hung out a lot during our week in Las Vegas. Just three months after the Las Vegas shows, encouraged by my mentor Don Kelley, Wolfman’s personal manager, I launched an entertainment public relations company with three clients: Wolfman Jack, Peaches & Herb and France Joli. If you consider that I had absolutely no formal training in public relations and had in fact failed both high school and junior college journalism, you have to believe anything can happen. Don Kelley whom I admire immensely, convinced me I could handle the job. He pointed out my way with words and penchant for coming up with creative promotional ideas. I attribute that to my previous years as a DJ and program director in radio. Still, shouldn’t I have actually done this before? “Not to worry,” reassured Don. “You know what to do, you just don’t know it yet,” he said. Image is no small part of being successful in Hollywood. Don figured that since I had no formal training in the field of public relations it would be necessary to make up the difference in image. Our neighbors at 6255 Sunset Boulevard included a variety of successful and hoping-to-be successful folks of all types. Four floors below was the Hollywood studio for an Atlanta, Georgia, startup called Cable News Network; three floors up was a company with a room full of video recorders, making boxes full of videotapes of public domain movies. The young techie owners of that company were absolutely convinced that there would be a market for people wanting to watch old black and white movies any time they wanted on high-priced video playback machines. There were two significant competing formats at the time: BetaMax (Sony) and VHS (JVC). Sony decided to keep its process secret, while JVC shared its engineering with other manufacturers. You know what happened. Just a note: the guys upstairs bet that BetaMax would be the winner. For the record: I started the PR firm with two partners, neither of whom was in show business. The association lasted about three months. Suffice it to say, they went away, and I stayed. Sitting behind the huge custom-built oak desk with the floor-to-ceiling windows in my 950-square-foot executive office, it was easy to believe I knew what I was doing. Behind my desk you could see the Hollywood sign to the north. At the far end of my office was a comfortable and elegant sitting area for meetings, with a complete wet bar along one wall and enough room to tap a golf ball across the fake putting green between meetings. Marcia was my friend’s girlfriend, and he thought she would make a capable personal assistant. She had worked at KNBC-TV (the NBC-owned station in Los Angeles) as an associate producer for David Sheehan, an entertainment reporter. In our first official meeting, we settled into the meeting area, her steno pad at the ready, and me hoping her knowledge and contacts would be a major help on the projects we had coming up. “So, what do you think we should do first to deliver the media to this event,” I asked, as if it were the final question in a big-money quiz show. “You don’t know?” she said, her eyes wide and face paler than usual. It was a moment we both have recalled and laughed about over the years. We both cracked up, realizing the absurdity of this entire scene. Marcia suggested that our first “to do” was to hire an entertainment publicist with experience. I took her advice, and soon we were absorbing the basics from our learned associate. Needing more space for additional employees, we gave up our ridiculously luxurious digs and moved in with Don Kelley at his Kings Road office above Sunset Boulevard. Here began the Glory Years of growth and prosperity. If there was a recession going on in 1980-82, we knew nothing about it. Business was good, and clients were signing up left and right. In less than a year we added Jenilee Harrison (ABC-TV’s “Three’s Company”), Larry Wilcox (NBC-TV’s “CHiPs”), Manhattan Transfer, Benny Mardones, and Frankie Valli, The Groundings Theater (where Paul Rubens created the Pee Wee Herman character), voiceover artist Greg Berg, character actor Edie McClurg, and radio personality Rick Dees, among many others. Most of the early ‘80s is a blur. I’ve tried to pencil out a timeline, but the details are fuzzy. I just remember having more money than I could spend and spending a lot of time on the road with clients. Mostly I remember it as fun. Lots of interesting things happened in the intervening years and those stories I will save for future issues. By 1984 things began to slow down. Whatever heat I had as the hot new entertainment publicist was cooling. I downsized the staff, and the agency was moved to a new space in Burbank, across from the Burbank Studios. Brian Avnet, who managed Manhattan Transfer and Frankie Valli and was developing new talent, invited me to share space with him. Although I had been working with Avnet and his partner Richard Burkhart since 1981, sharing an office space with them was an important learning experience, and we developed a friendship that endures today. I saw Brian recently when he was in Dallas with his discovery/client Josh Groban and visited with Richard last summer backstage at Bass Hall in Fort Worth, when he was there with his client Chuck Mangione. The building on West Olive Avenue was owned and occupied by actor/producer husband and wife team, Alex Karras and Susan Clark, whose hit television sitcom “Webster” was in full blossom. On the second floor and across the hall was a newly formed agency that represented songwriters and music producers. This new setting was brimming with show biz atmosphere. The next two years were a little shaky. There is a part of me that feels like my lack of experience finally caught up with me, but it takes much more than skills to be continuously successful in the entertainment industry. Every bit as important as talent is the ability to network and be sociable. If you were willing to attend, there was a party or event every night of the week except Sunday. You could choose from all types of engagements, from small get-togethers to movie premieres. It’s not like I never went out, I did, but I never really enjoyed being in a crowd. I am and always have been, painfully shy. Anyone who knows me casually will disagree with that description, but those who know me well know it’s the truth. If you are going to be successful in Hollywood, you must be able to walk, talk and act like you’re somebody. It’s not enough to do good work. Personal relationships are the lifeblood of show business. It absolutely is who you know and the juice you have, or appear to have. In the Hollywood social structure, you are judged as much by your surroundings as by your talent. What lists you are on determines your “heat” factor. At the peak of my career, I was on a number of important lists for private parties, movie premieres, private screenings, and just about any event that required a tuxedo, of which I owned three custom made. It was not uncommon to receive multiple invites for a single night. On one evening in 1982, I attended a private screening at Burbank Studios with director Taylor Hackford and some studio executives, to see a rough cut of “An Officer and a Gentleman.” The film went on to win two Academy Awards®. Later that night I attended a private party at the home of famed superagent, Michael Ovitz. The party was at his hotel-sized house in the Brentwood section of Los Angeles. The soiree was littered with famous faces. Right now you’re asking yourself, “What is Dan Acree’s problem?” There you have it. I am an Oklahoma-born-and-raised small-town boy who stumbled over an opportunity that brought me to La La Land. I never fit in, and I was never comfortable with myself in these situations. I managed to make a good living, but I was never able to develop the important, long-term relationships that come from working the social calendar on a nightly basis. Most of the time, if I felt I absolutely must be at an event, I would arrive and make the rounds so that I was seen. The few people I called friends would see me and feel encouraged that I was finally getting out there and doing what had to be done. But at the first opportunity, I would scout out a rear exit and disappear, usually less than an hour after I had arrived. On the way home much too early, I would drive through the Jack in the Box and grab a hamburger and fries. Heading home with an Ultimate Cheeseburger in my hand was the highlight of my evening. No more pressure to be cheerful, chatty, or clever, or to remember people’s names and why they might be important to my career. It’s easy to understand why I did not thrive in show business. From 1984 to 1986, the public relations agency atrophied. I was still working with a few clients, like singer Stephanie Mills and Rick Dees, Frankie Valli and Manhattan Transfer, but the end was in sight, and I honestly could not wait. Just when I felt I was at my lowest point in seven years, an opportunity crossed my path. Oddly enough, it is the very thing that if it had presented itself in 1979 might have led to my still being in Hollywood. It was the opportunity that led me to be in charge of the entire press corps backstage at the 28th Annual Grammy Awards® telecast. But I’ll save that for the next installment of my back story.